If you have some old t-shirts lying around that are really, really no good for wearing or donating, cut them up into rags. Just get a sharp pair of scissors, cut out the neck edging and the seams, and cut the remaining fabric into your desired rag size. I have a big pile of these, and we love them for dusting and cleaning kitchen surfaces like dishwashers and the fridge. Also, my girls like to use them for washing their faces because hey, if makeup or acne medication gets on them, no one cares! They were ugly rags to begin with. And I love that we have something functional made from clothing that was no longer wearable. As you can see, I don’t bother folding mine; I just wash them, dry them, and throw them into this box that sits in my linen closet. Easy, easy! I do the same thing- they really come in handy for extremely messy things too. There is no guilt if you have to throw one away. I have some cut from black T-shirts, and I use them to take off waterproof mascara with some olive oil. I wash them in a garment bag, so they don’t end up sopping wet, wadded up in the folds of our front-loading washer at the end of the cycle. (I keep the bag in the dirty laundry pile and add them to it until I do a load, then wash and dry the whole thing and then put the bag back into the dirty laundry pile—nothing fancy). Ann, I’m going to try your idea. I like what mascara does for my almost invisible eyelashes but I’m not crazy about what removing it does to my facecloths. Thanks! I hope it works well for you! I meant a delicates bag…not a garment bag! Another idea for crafty sorts with t-shirts that aren’t too worn out (with holes and such) is to cut them into t-shirt yarn and crochet a basket or rug or something else you could find on Pinterest. We’ve also used t-shirt strips for tying up plants in the garden. All of this is because we are still using worn out cloth diapers for rags; someday we’ll need t-shirts for that. Maybe. We have also used old cloth diapers for rags for years after our last babies (now 8!) The prefolds were super absorbent, and I also had made some flannel inserts that are now great cleaning rags. If you follow the Curly Girl method for washing your hair, old t shirts are supposed to be amazing for drying your hair! I really like using old t shirts for dusting too. They work so well! 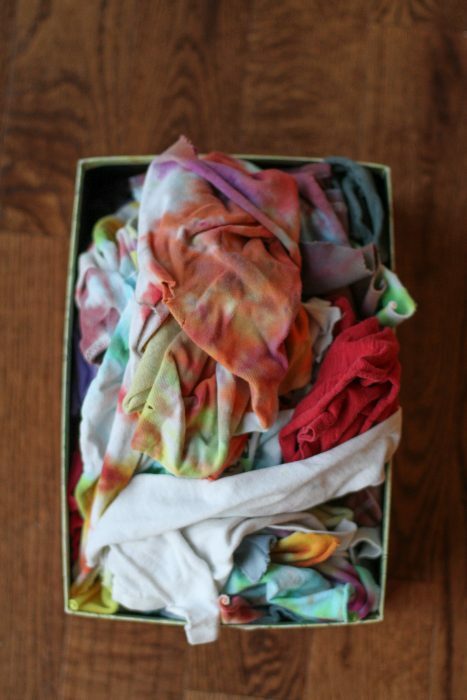 When I got married, my mother in-law gave me a cardboard box of good rags. I used and added to that box for many years. I can’t remember when I finally had to replace the box. She also gave me a jar of used buttons and a stash of homemade quilts. Everyone needs a jar of buttons just like we all need a jar of random screws and nails that we’ll never use. A secret: you don’t even have to cut them. You don’t find that to be super bulky to work with? I don’t like the sleeves especially! Larger rags are useful for big spills and proofing big baked goods (though honestly we use them for cleaning counters if they’re what’s on top). We do have smaller rags, but that’s generally because larger rags get fabric fatigue and rip apart. We do still have a 6 year old which means we still get big puddles from time to time. I do like having larger ones…but it’s the seams and the collar that seem inconvenient to me! If you cut those out, you can still have a pretty large rag from the body of the shirt. But of course, you do what works for you. I’m not about to argue that my way of cutting up and old tshirt is right for everyone. I don’t think there’s a wrong way to do this. My roommate doesn’t cut and I find that quite inconvenient. A t-shirt rag is at least two layers and has hard hemmed edges. It’s too big, now the whole rag must be washed even if only part of it is dirty, and the hems get in the way. My preference is to cut off the hems and cut the shirt in half. Then I have four rags: two small ones from the sleeves, two large ones from the body. You can use the smaller ones for small spills and the bigger ones for big spills. Then no worries about washing. By the time a t-shirt is a rag in our house, it is already falling apart because first DH wears them until they are no longer presentable, and then I wear them to bed until fabric fatigue really sets in. So no problems with hardness or hems. Everything is soft. YMMV. Yep, that’s exactly how I do it too! A whole t-shirt is too much fabric to be useful to me. 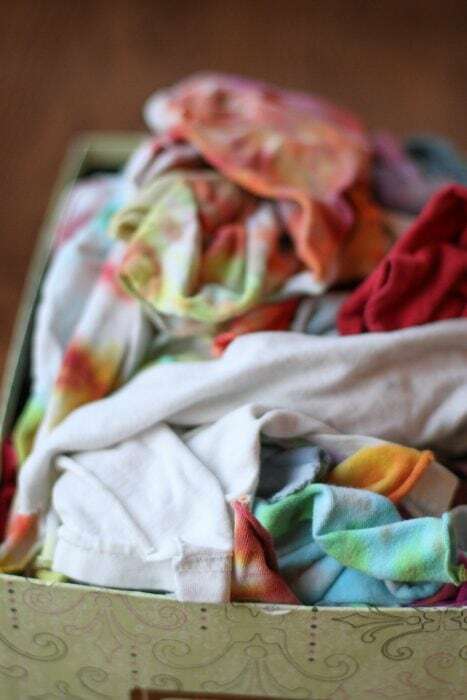 We use my husband’s old white tee-shirts this way, as well as our colored ones, but the white ones seem to bite the dust more easily, so we have more of them to add to our rags. They work great on a lot of things, and if they are 100% cotton, can be composted later if you want. I use rolled up old tee-shirts stuffed in my boots, to keep my boots upright in the closet, so the boot ankles don’t develop “breaks” in them. They make good plant ties, as mentioned. I’m glad to hear so many other people use old shirts as rags! I felt kind of alone, as the one person in my circle who did this. T-shirts make the best rags! They’re also great for baby wash cloths because they’re so soft and thin. Perfect for tiny faces and hands. Now you have made me feel bad Kristen. I’m thinking about all those old undershirts , pj’s, etc that I have just thrown out, never to be recovered! And I am so proud of myself for saving the paper napkins for clean up and buying packs of kitchen towels to use. Well at least I have nice square matching kitchen towels while you have multi colored, multi sized, multi material ones! But, you win, as usual! Don’t feel bad, David, more will come along. If you wish to hasten the process, check garage sales and thrift stores, where they can be had for less than the price of a single roll of paper towels. I do the same thing, with old towels. I tend to replace them every 5 years or so and I will keep a few in reserve for giant messes. With the others, I will cut one bath towel into 9 – 12 kitchen towels. We use these as napkins every meal and then wipe down the kitchen with them after every meal. I haven’t bought napkins in years and only buy paper towels a few times a year – cloth doesn’t sop up pizza grease well. I have my T-shirt rags pile, my old towel rag pile, and my old flannel nightgowns and shirts rag pile. All good. And yes, I do compost them in the end. I don’t think cotton grows in Illinois, or I might try to complete the cycle!!! Jenny, I grew up in Southern Illinois, and cotton used to grow there! I meant to add to my post that cut up, old thermal waffle-weave underwear makes great gentle scrubbing rags. Yes, I agree, and we have plenty of those (long undetwear) Northern Illinois! We use them for baby wipes with our cloth diapers. We just squirt water on over a bowl during changes. So easy and soft. 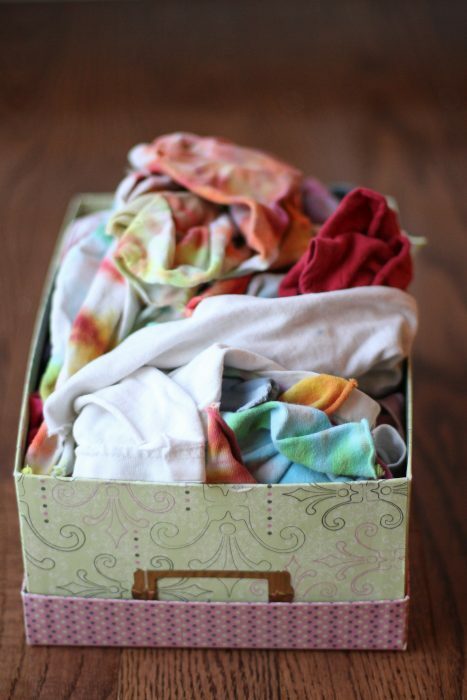 Thank you so much for this post Kristen – I have been trying to reduce my use of paper towel etc and looking at some very sad t-shirts, and thank you to everyone for your comments; lots of great tips. Just cut up an old t-shirt yesterday – they are the best for cleaning mirrors!